The lineup for the 2012 Dunk contest is set. Blake Griffin has been excused since he has pretty much done it all already. So who's going to be dunking this year? According to Marc Stein of ESPN, the contenders will be Chase Budinger of the Rockets, Paul George of the Pacers, Iman Shumpert of the Knicks, and Derrick Williams of the Timberwolves. 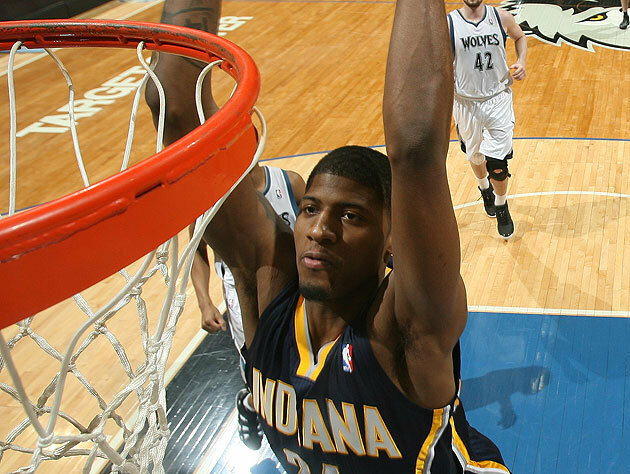 Paul George going for a dunk. No real controversy over Budinger, George or Williams, but Shumpert is a different story. There are thoughts that Shumpert was only placed in this year's contest so that teammate Jeremy Lin might accompany him. That too would explain why Kenneth Faried of the Nuggets was not selected for the event. While he won't be dunking, Lin is sure to make an appearance. It'll be Linsane if he doesn't though.